Milking Solutions (MS) manufactures high quality spare parts for Gascoigne Melotte milking machines and equipment and generic milking parts for all parlours. MS distributes these spare parts direct to our dealers around the world. MS carries high stock levels, which allows a very fast delivery service e.g. from receipt of order, 1 day for UK, 3 days to Europe and 5-7 days for the rest of the world. MS is very experienced with Gascoigne Melotte spare parts and equipment. 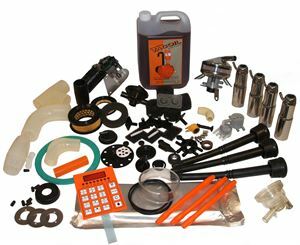 MS aims to provide a "One Stop Shop" (everything you need) for all your Gascoigne Melotte spare parts needs. Milking Machine Service Companies: MS respects and supports milking machine service companies around the world. MS and dairy farmers need to keep these companies profitable to ensure they are there when needed. Please Note: We are not Gascoigne Melotte. We do not represent Gascoigne Melotte or Boumatic Gascoigne Melotte. All original part numbers used are for reference / fitment purposes only.